← Should Labels Say Meat Was Made In USA? The Burmese slaves sat on the floor and stared through the rusty bars of their locked cage, hidden on a tiny tropical island thousands of miles from home. EDITOR’S NOTE: The Associated Press notified the International Organization for Migration about men in this story, who were then moved out of Benjina by police for their safety. Hundreds of slaves remain on the island, and five other men were in the cage this week. The men The Associated Press spoke to on Benjina were mostly from Myanmar, also known as Burma, one of the poorest countries in the world. They were brought to Indonesia through Thailand and forced to fish. Their catch was shipped back to Thailand, and then entered the global commerce stream. In a year-long investigation, the AP interviewed more than 40 current and former slaves in Benjina. The AP documented the journey of a single large shipment of slave-caught seafood from the Indonesian village, including squid, snapper, grouper and shrimp, and tracked it by satellite to a gritty Thai harbor. Upon its arrival, AP journalists followed trucks that loaded and drove the seafood over four nights to dozens of factories, cold storage plants and the country’s biggest fish market. Some fishermen, risking their lives, begged the reporters for help. Their catch mixes in with other fish at numerous sites in Thailand, including processing plants. U.S. Customs records show that several of those Thai factories ship to America. They also ship to Europe and Asia, but the AP traced shipments to the U.S., where trade records are public. The major corporations identified by AP declined interviews but issued statements that strongly condemned labor abuses; many described their work with human rights groups to hold subcontractors accountable. National Fisheries Institute spokesman Gavin Gibbons, speaking on behalf of 300 U.S. seafood firms that make up 75 percent of the industry, said his members are troubled by the findings. The slaves interviewed by the AP described 20- to 22-hour shifts and unclean drinking water. Almost all said they were kicked, beaten or whipped with toxic stingray tails if they complained or tried to rest. They were paid little or nothing. Runaway Hlaing Min said many died at sea. The small harbor in the village is occupied by Pusaka Benjina Resources, whose five-story office compound includes the cage with the slaves. The company is the only fishing operation on Benjina officially registered in Indonesia, and is listed as the owner of more than 90 trawlers. However, the captains are Thai, and the Indonesian government is reviewing to see if the boats are really Thai-owned. Pusaka Benjina did not respond to phone calls and a letter, and did not speak to a reporter who waited for two hours in the company’s Jakarta office. At the Benjina port, the AP interviewed slaves from a dozen fishing vessels offloading their catch into a large refrigerated cargo ship, the Silver Sea Line. The ship belonged to the Silver Sea Reefer Co., which is registered in Thailand and has at least nine refrigerated cargo boats. The company said it is not involved with the fishermen. 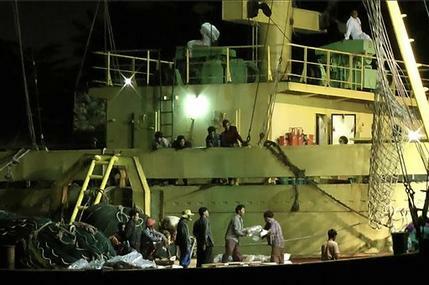 The AP followed that ship, using satellite tracking over 15 days to Samut Sakhon, Thailand, and journalists watched as workers packed the seafood over four nights onto more than 150 trucks, following deliveries to factories around the city. Inside those plants, representatives told AP journalists that they sold seafood to other Thai processors and distributors. U.S. Customs bills of lading identify specific shipments from those plants to American firms, including well-known brand names. For example, one truck bore the name and bird logo of Kingfisher Holdings Ltd., which supplies frozen and canned seafood around the world. Another truck went to Mahachai Marine Foods Co., a cold storage business that also supplies Kingfisher, according to Kawin Ngernanek, whose family runs it. When later asked about abusive labor practices, Kawin was not available. Instead, Mahachai Marine Foods manager Narongdet Prasertsri responded: “I have no idea about it at all.” Kingfisher did not answer repeated requests for comment. Every month, Kingfisher and its subsidiary KF Foods Ltd. sends about 100 metric tons of seafood from Thailand to America, according to U.S. Customs records. These shipments have gone to Stavis Seafoods, a Boston-based Sysco supplier, and other distributors. “The truth is, these are the kind of things that keep you up at night,” said CEO Richard Stavis, who grandfather started the company. He said his business visits international processors, requires notarized certification of legal practices and uses third-party audits. “There are companies like ours that care and are working as hard as they can,” he said. A similar pattern repeats itself with other companies and shipments. The AP followed another truck to Niwat Co., where part owner Prasert Luangsomboon said the company sells to Thai Union Manufacturing. Weeks later, when confronted about forced labor in their supply chain, Niwat referred several requests for comment to Luangsomboon, who could not be reached for further comment. Thai Union Manufacturing Co. is a subsidiary of Thai Union Frozen Products PCL, Thailand’s largest seafood corporation, with $3.5 billion in annual sales. This parent company, known simply as Thai Union, owns Chicken of the Sea and is buying Bumble Bee, although the AP did not observe any tuna fisheries. Thai Union says its direct clients include Wal-Mart, and ships thousands of cans of cat food to the U.S. every month, including household brands like Fancy Feast, Meow Mix and Iams. These end up on shelves of major grocery chains, such as Kroger, Safeway and Albertsons, as well as pet stores. Again, however, it’s impossible to tell if a particular can of cat food might have slave-caught seafood. After the AP’s story was released Wednesday, the company issued a statement saying it had immediately terminated business ties with a supplier after determining it might be involved with forced labor and other abuses. It did not say which supplier. Indonesian Fisheries Minister Susi Pudjiastuti, who has been cracking down on illegal foreign vessels, including those from Thailand, vowed to take swift action. She tweeted the AP’s report and distributed copies of it in a meeting to a wide range of high-ranking government officials, including police, a high court judge, a prosecutor, the Navy and customs. “I’m not going to tolerate such a thing to continue happening in our waters,” she said in an interview. She added that campaigns to save wildlife get far more attention than abuse involving humans at sea. Illegal fishing is “killing people and nobody knows or cares about this for so long,” she said. The enslaved fishermen on Benjina had no idea where the fish they caught was sold, only that it was too valuable for them to eat. Their desperation was palpable. A crude cemetery holds more than 60 graves strangled by tall grasses and jungle vines. The small wooden markers are neatly labeled, some with the falsified names of slaves and boats. Only their friends remember where they were laid to rest. In the past, former slave Hla Phyo said, supervisors on ships simply tossed bodies into the sea to be devoured by sharks. But after authorities and companies started demanding that every man be accounted for on the roster upon return, captains began stowing corpses alongside the fish in ship freezers until they arrived back in Benjina. Robin McDowell contributed to this report from Benjina, Indonesia. Mason reported from Samut Sakhon, Thailand; Mendoza reported from Boston, Mass.